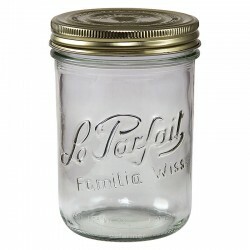 Le Parfait Familia Wiss jars are a mason style jar. The jars are heavy duty tempered glass suitable for pressure canners and water baths. 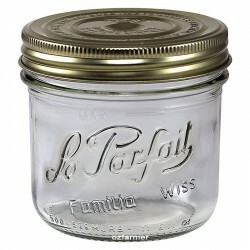 Like Ball mason jars, Familia Wiss jars have a 2 piece lid assembly. The flat lid incorporating the seal is called the sealing cap. Note that these are shipped on the jar in an inverted position to prevent any prior impact on the seal prior to use for preserving. These sealing caps are single use only. 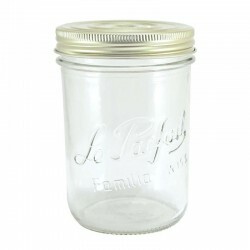 The screw lid is a one piece lid (rather than a band as is standard for Ball jars). This lid fulfills 2 roles: it holds the sealing cap in place during heat processing and once the jar has been opened, the screw lid can then be used as a storage lid. 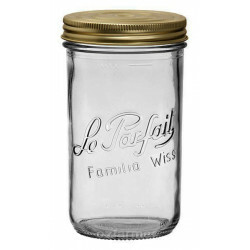 Le Parfait Familia Wiss jars come in 7 different sizes, allowing you to have a full range for your preserving needs. The lid sizes are non standard and are not compatible with other mason lids. The 3 sizes used are 82mm, 100mm and 110mm so only le Parfait replacement sealing caps and lids can be used. On the plus side though, the extra wide openings make it very easy to get your food into the jars.